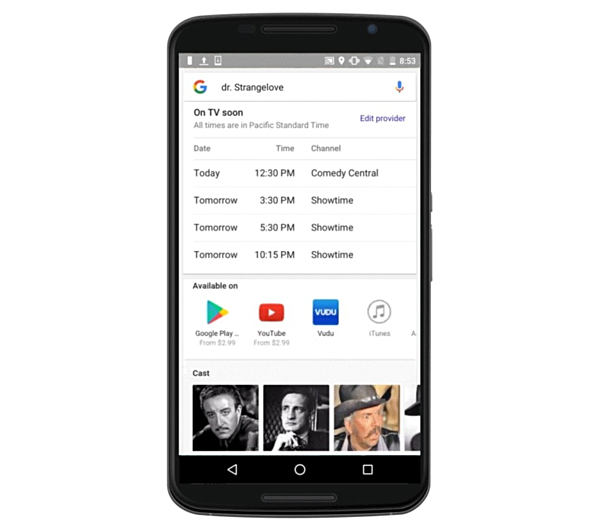 Google has announced that it will soon start showing live TV listings in search results. This means, in future, when you'll search for a TV show on Google, the results will also contain a list of channels on which the show will be aired along with the date and time information. "So now when you're looking for The Big Bang Theory, we'll not only show you the apps and sites where you can find the latest episode, but also show which channel you can turn your tv to later in the evening or week to catch it live," Google said in a blog post. Aside from this, the Mountain View, California-based company also made some announcements related to its advertising business - for example, personalized TV ads with DoubleClick Dynamic Ad Insertion. Head to the Source link below to learn more about them.